Spring is fast approaching. With skiing only a few weeks ago, it seems weird, but I welcome it with open arms and open skin. Vitamin D and bronzed skin is coming! We're kicking off the beautifully sick weather this weekend with a little BBQ at our place. Frisbee, bags and beer pong are going to be the perfect solution to sick doldrums. I hope there are strawberries! 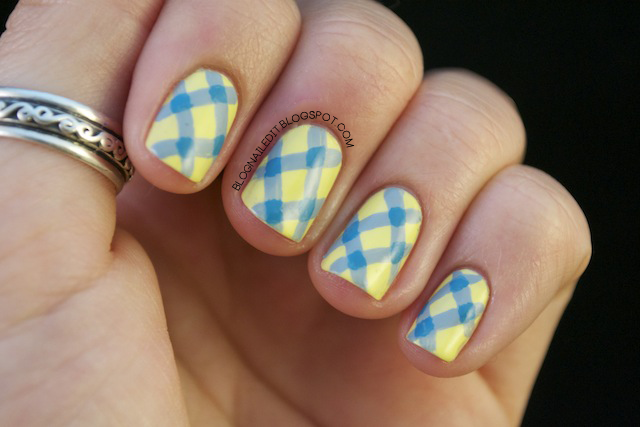 The yellow is Lemon Fizz, the lighter blue is Sea Spray and the darker blue is Flyin' High, all by China Glaze. 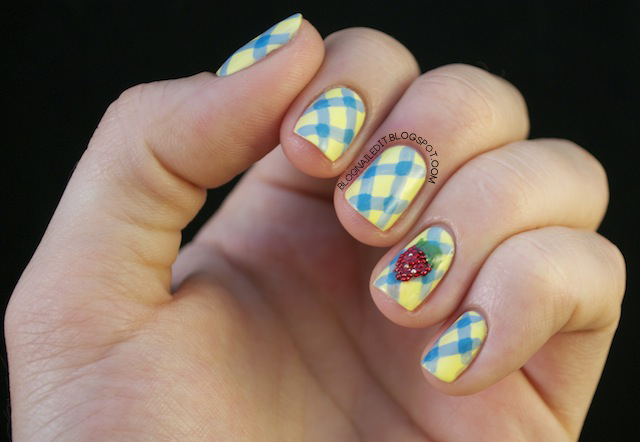 You may recognize this plaid technique from Candice's manicure. I switched it up slightly using diagonals, and after photographing it, decided to spice it up even more with some berry lovin'. cute!! have a good time today! Enjoy the BBQ! Sounds fun :) Love you mani! ooooh nice! how'd you do this? :) just drag the brush across? Basically. I had to go over the lines a few times to get the right opacity sometimes, but that's essentially what I did. The darker squares where the lines intersect were also just drawn freehand, with a darker color. ohh i see. okay thanks :) this is really pretty!